Requirement: Remove drop off library in SharePoint Online. Site owner activated "Content Organizer" feature in a site which brought "Drop Off Library" into the SharePoint Online site. Now, when he tried deleting this library by going to library settings, he could not find "Delete this document library" link in the library's settings! Deactivating the content organizer feature didn't help. 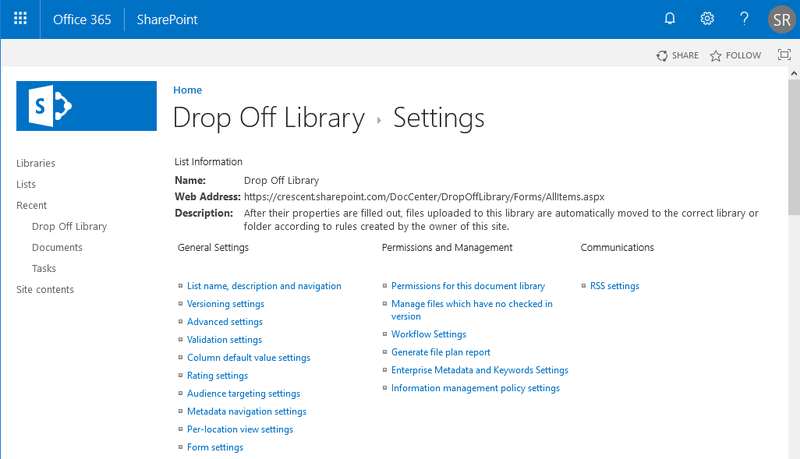 So, How to delete the drop off library from SharePoint Online? As the drop off library doesn't provide "Delete this Library" link, we've to use PowerShell to delete this library. We can delete the Drop Off Library by setting: AllowDeletion property. Here is the PowerShell script to delete the drop off library in SharePoint Online. Write-Host -f Green "Drop Off Library Deleted Successfully!"